Virgin Galactic's second SpaceShipTwo vehicle under construction at a hangar in Mojave, California. The first SpaceShipTwo was destroyed in a tragic accident in October 2014 that killed copilot Michael Alsbury and injured pilot Peter Siebold. 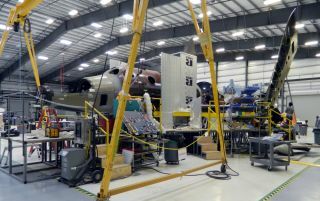 Six months after Virgin Galactic's SpaceShipTwo crashed during a test flight, a new version of the suborbital space plane is coming together in a hangar in the California desert. SpaceShipTwo, which was known as VSS Enterprise, broke apart in midair on Oct. 31, 2014, killing copilot Michael Alsbury and injuring pilot Peter Siebold. Virgin Galactic representatives vowed to press on despite the tragic accident, and another SpaceShipTwo is indeed taking shape. "That new vehicle — which has not yet been formally named, though it's had various internal nicknames over the years — is coming along at a steady pace, thanks to the efforts of the women and men in our manufacturing organization, The Spaceship Company," Virgin Galactic representatives wrote in an update Monday (May 4) that included a new photo of the vehicle under construction at a facility in Mojave, California. "In recent weeks, we've finished the final cure cycle of the main cabin (pictured here), closed out the main portions of the wings, and completed other important steps in the build plan," they added. The six-passenger SpaceShipTwo spacecraft is designed to take paying customers on brief journeys to suborbital space. The space plane is carried to an altitude of about 50,000 feet (15,000 meters) by an aircraft called WhiteKnightTwo, then dropped. At that point, SpaceShipTwo's onboard rocket engine fires up, propelling the craft upward. SpaceShipTwo is still in the test phase — the Oct. 31 mission was the vehicle's fourth rocket-powered test flight — but hundreds of hopeful customers, including a number of celebrities, have already put down deposits to reserve a seat. Tickets currently sell for $250,000 per seat. SpaceShipTwo's "feathering" system, which rotates the vehicle's tail booms upward to increase stability and drag during re-entry to Earth's atmosphere, deployed too soon on Oct. 31, investigators with the National Transportation Safety Board (NTSB) have determined. The NTSB is still looking into crash; officials have said the investigation could take a year. Virgin Galactic representatives say that safety remains their top priority, and that they will not rush the new SpaceShipTwo into the skies. "Our hope is that the second SpaceShipTwo will enter into testing later this year, beginning with ground testing, then progressing through captive carry flights, glide flights, and eventually powered flights to progressively higher speeds and altitudes," company representatives wrote in Monday's update.